Charlotte Holmes and Jamie Watson are the great great great grandchildren of Sherlock Holmes and Dr. Watson. They have never met before, but as with all of the Watson and Holmes family members, they are knowledgeable and curious about each other. Well, at least the Watson’s in this book showed curiousity, and the Holmes’ tolerated it. Charlotte and Jamie find each other going to the same school in Connecticut and become the main suspects in a murder. Charlotte has to do more than tolerate Jamie, she has to work with him to find the murderer. Brittany Cavallaro crafts an intricate mystery filled with the history of one of our most famous pairs of detectives but in a contemporary setting and told with a great amount of humor. 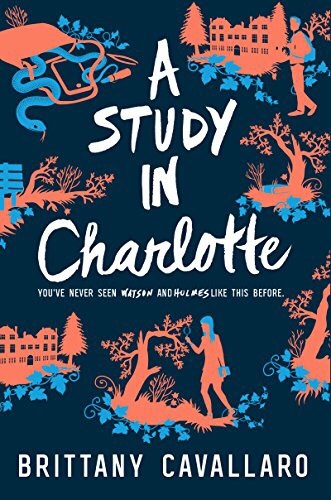 Jamie Watson had followed Charlotte’s amateur sleuthing career with dreams of someday meeting her and matching wits. When he finds himself at the same school he is a flustered school boy, which does not charm Charlotte at all. In fact, if they were not being set up for murder, she probably would have gone on ignoring his presence. However the chemistry between the two was almost instant, although not the kind of chemistry Jamie had dreamed of, at least not yet. Working this mystery together and chasing down leads put them on a fast track to friendship and when their lives are in danger they find out that they can only rely on each other.